Everyone needs a Little Helping Hand - especially when soldering. This is a small helping hands tool that is incredibly useful for holding light weight parts when building robots and other electronic projects. 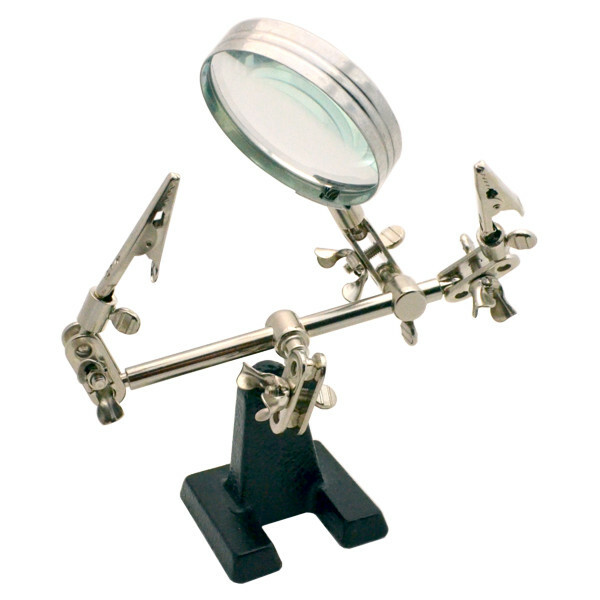 It has two alligator clip hands to hold onto your parts and a magnifying glass to see them better. The base of this small helper is heavy enough to provide a bit of stability while the frame is adjustable at various points for needed flexibility. Simply loosen the wingnuts at various joints to adjust the position of the hands then tighten them into place. The magnifying glass position is adjustable too. This helping hands tool can stretch up to about 7 1/2 inches tall by 5 1/2 inches wide. The magnifying lens is 2 1/2 inches in diameter. It weighs about 13 ounces.